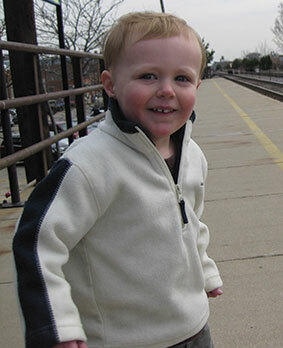 Colin Edward Brophy was born December 6th 2006 at Froedert Hospital in Milwaukee Wisconsin. Although we live in Chicago, we decided to have our baby at Froedert because at our 20 week ultrasound our child was diagnosed with Hypoplastic Right Heart Syndrome, Transposition of the Great Arteries, and Coarctation of the Aorta. Needless to say these diagnoses’ came as a crushing blow to us as first time parents. No parent wants to hear there is something wrong with their child. After much research and input from dear friends in the medical field, we decided to have Colin at Froedert so that he could receive the care he needed for his heart immediately. Colin was born at 11am and after briefly holding him and whispering that we loved him he was whisked away to the NICU at Children’s Hospital of Milwaukee. He would be in the NICU for a few days in preparation for the first of three surgeries he would need on his heart. His was given a medicine called prostaglandin to keep a duct called the PDA open (this usually closes a few days after babies are born). This duct would be Colin’s means of getting blood to the lungs. He was scheduled to have his first surgery on the Monday following his birth (he was 5 days old), but we had to delay the surgery due to a blood infection he got in the NICU. After a few doses of antibiotics, and nutrition thru the IV line, it was decided that he would be healthy enough to withstand surgery 8 days after he was born. The surgery would consist of placing a band around his pulmonary artery to encourage blood flow to the aorta and thus the rest of the body. Colin would also need surgery on his aorta itself to correct the Coarctation. Colin came through the surgery with flying colors and was sent home with us one week after the surgery. He was able to go home so quickly because of the stupendous care he received at CHW-from the nurses to the PA’s to the doctors-they are all wonderful. Colin’s second surgery occurred when he was four months old. We returned with him to Children’s Hospital of Wisconsin for the surgery. This surgery would consist of a procedure called the Glen or Hemi-Fontan Procedure. This consists of redirecting the blood from the upper body straight to the heart and thus bypassing the right side of the heart. This surgery would also consist of a procedure called the Damus-Kaye-Stansel Procedure. This part of the procedure helps get more blood flow to the aorta. We stayed one week at the hospital and Colin came through with flying colors. Again, we cannot comment enough on the great care he received from the entire health care team at CHW. Colin will need the final stage of surgery sometime in the next year or so. In the meantime he is a brave, curious, playful, energetic little boy who enjoys everyday! We love you Colin-Love Mom and Dad! !